Maruti Suzuki has launched the second-generation of its 7-seater Ertiga with prices starting from ₹ 7.44 lakh. 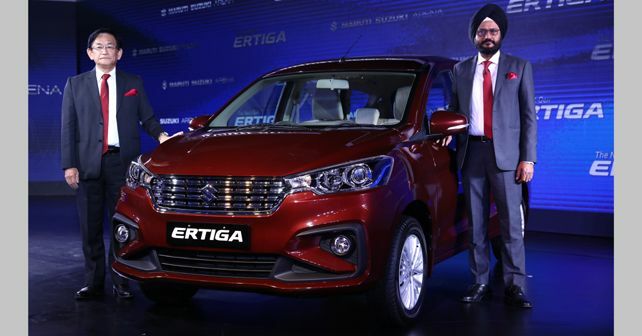 After the Baleno, Ignis, Dzire and the Swift, the second-gen Ertiga is Maruti's fifth model to feature the brand's acclaimed 5th-gen Heartect platform. As a result, the new Ertiga offers higher build rigidity than the outgoing version. Despite sharing the same wheelbase as it's predecessor (2,740mm), the new car is longer and wider than the old car by 99mm and 40mm, respectively. This translates to better legroom and shoulder room for second and third-row passengers. The new Ertiga comes with the same 185/65 R15 tyres but they have been fitted to newly-designed 15-inch alloy wheels. The exterior has also been jazzed up by the addition of premium features like a floating roof, projector headlamps, LED tail lamps and a chunky, chrome-studded front grille. On the 2018 Ertiga, the most crucial change comes in the form of the new K15 1,462cc Smart Hybrid petrol engine which made its debut on the 2018 Ciaz. The power output of the new motor is pegged at 103bhp as compared to the outgoing model’s 90bhp. Even the torque figure has seen an increase of 8Nm, which is now at 138Nm. The diesel variants will be powered by the 1.3-litre DDiS 200 Smart Hybrid motor which will be good for 88.5bhp and 200Nm of torque. Transmission choices will be between a 5-speed manual or a 4-speed automatic torque-converter. However, the automatic gearbox will only be available with petrol derivatives. On the inside, the new car gets added features to maximise convenience for rear passengers. While the third row of seats gets a 50:50 split fold and recline functionality, the second row of seats now come with a one-touch recline and slide mechanism for an easier third-row access. The dual-tone interiors feature a sculpted dashboard layout with maple wood finish and chrome accents and the driver is greeted by a leather-wrapped flat-bottom steering wheel. The dashboard is further highlighted by a 17.8cm touchscreen infotainment system enabled with Apple CarPlay, Android Auto and MirrorLink connectivity. On the safety front, the new Ertiga comes equipped with features like dual airbags, high-speed warning alert, front seat belt with pre-tensioners, ISOFIX child seat anchorages, ABS with EBD, brake assist and rear parking sensors as standard fitment across all variants. While the new Ertiga is sure to keep its occupants safe, it will also prevent you from burning a hole in your pocket as the fuel-efficiency figures for the diesel and petrol (MT) derivatives stands at 25.47 km/l and 19.34 km/l, respectively. The petrol manual version of the new Ertiga will be available in four variants – Lxi, Vxi, Zxi and Zxi+ – while the petrol automatic is being offered in the top two trims – Vxi AT and Zxi AT. The diesel, with the absence of an automatic gearbox, is available in four standard variants – Ldi, Vdi, Zdi and Zdi+. Furthermore, Maruti has added a new exterior colour to the Ertiga line-up - a Pearl Metallic Auburn Red. Other colours on offer include Metallic Magma Grey, Pearl Metallic Oxford Blue, Pearl Arctic White and Metallic Silky Silver.